Fluffy Red Velvet Cake with rich Cream Cheese Frosting and topped with Chocolate Ganache — perfect for every special occasion. This is the BEST Vegan, Gluten-free Red Velvet Cake recipe! Yes, that’s right, it’s the bomb diggity, and it’s what we are having for breakfast Christmas morning. You read that correctly…. BREAKFAST. One of our traditions is to to make a birthday cake for Jesus and have that as our Christmas morning breakfast. For us, it’s a way to help the kids remember what the season is about, before it quickly becomes all about them and the presents they all received. The types of cakes and decorations have varied over the years. 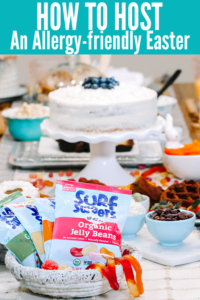 We’ve had German Chocolate Cake covered in coconut sprinkles, Fluffy Vanilla Cake with Vanilla Frosting and sprinkles, Gluten-free Blueberry Banana Cake with lots of candles and Chocolate Sheet Cake with fudge frosting, decorated by the kiddos. But this year, we’re going the Red Velvet route and making it extra fancy with homemade Cream Cheese Frosting and Chocolate Ganache. All perfectly vegan, allergy-friendly and gluten-free of course. This Red Velvet Cake was made 6 times this week (yes 6x), in order to share the best cake possible with you all. I initially wanted to create a healthier cake, by using agave instead of sugar, and coconut oil instead of butter but it just didn’t cut it. Now don’t get me wrong, it was still good, but not light and fluffy which is what I wanted. So… sugar and butter is necessary to achieve red velvet magic! 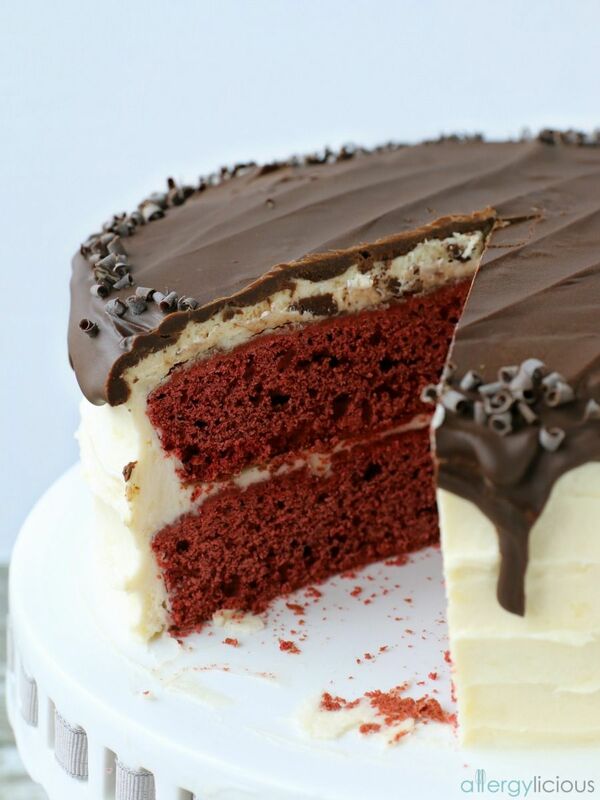 This red velvet cake is seriously dreamy! But if the photos haven’t convinced you yet, then let me entice you farther. This cake is…. I may or may not have made extra frosting just in case more sampling was required. This cake is not only ideal for Christmas, but it’s also a show stopper at birthdays or other special occasions. You’ll be the Martha Stewart at the next party! And if you love red velvet then check out our Chocolate Dipped Red Velvet Cookies for a bite sized version. 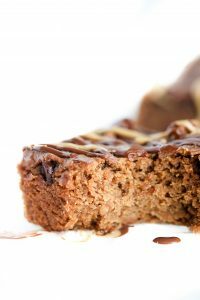 Our German Chocolate Cake is where you’ll get the ganache recipe from, so grab that too, plus it’s stinkin’ amazing! So go on and make this gorgeous red velvet cake , serve it for breakfast like us, or just enjoy every vegan + gluten-free bite at your celebration of choice. Two gorgeous fluffy layers of vibrant red cake, topped with addicting cream cheese frosting and drenched in chocolate ganache. Perfect for Christmas, birthdays or any other special occasions. Preheat oven to 350°. Grease and flour two 9″ round baking pans. In a stand mixer, combine butter, cane sugar, salt and cacao until fluffy. In a small bowl #1, whisk the egg replacer with dairy-free milk, 2 TB of apple cider vinegar, vanilla and red food coloring. Alternate adding this mixture and flour to the stand mixer while running on low, scraping down sides as needed. In small bowl #2, mix baking soda and 2 teaspoons vinegar then fold into batter. Divide batter evenly between prepared pans and bake 25-30 minutes. If toothpick inserted in the middle comes out clean, then it’s ready. Cool pans on a wire rack at least 10 minutes then flip over to release. Cool completely before icing. In a stand mixer, whip the butter, cream cheese, vanilla and maple syrup until smooth, making sure to scrape the sides to incorporate it all. Lower speed and slowly add the powdered sugar a little at a time. Once combined, whip on high for a minute to get nice and fluffy. In a microwave safe bowl, melt the chocolate chips and butter for 45 seconds. Stir until the chocolate is melted and smooth. Set aside to cool. Place the first cake on a serving plate and spread with 3/4 cup frosting. Top with second layer and spread with remaining frosting on the top and sides. Pour cooled chocolate ganache on top of frosting and allow to drip down the sides a little. *If using another flour, please follow their directions if Xanthan Gum is required. This is a really great idea for those who come to gatherings and have concerns with their allergies. I can’t wait to try this for my friends at New Years! Awesome Nicole. Please come back and share your feedback. 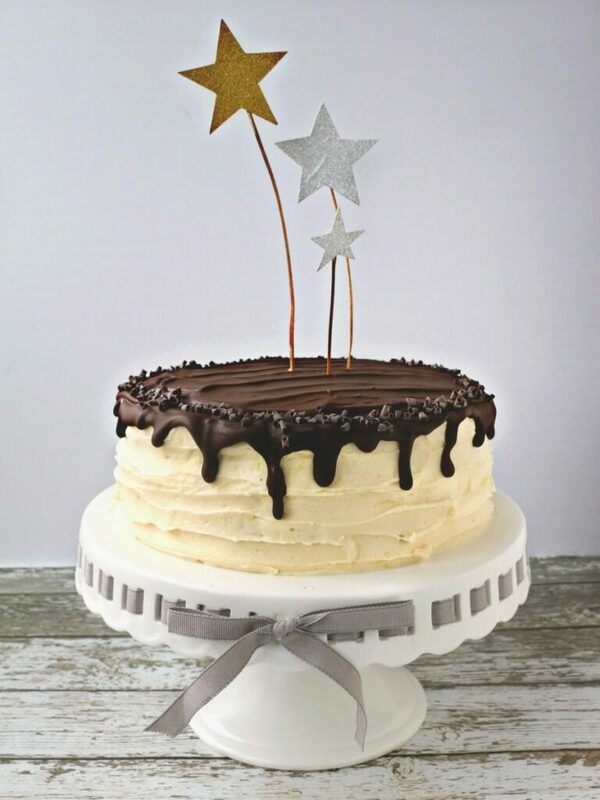 It’s a cake that you can share anytime so New Years would be great. This cake is above and beyond Nicole! 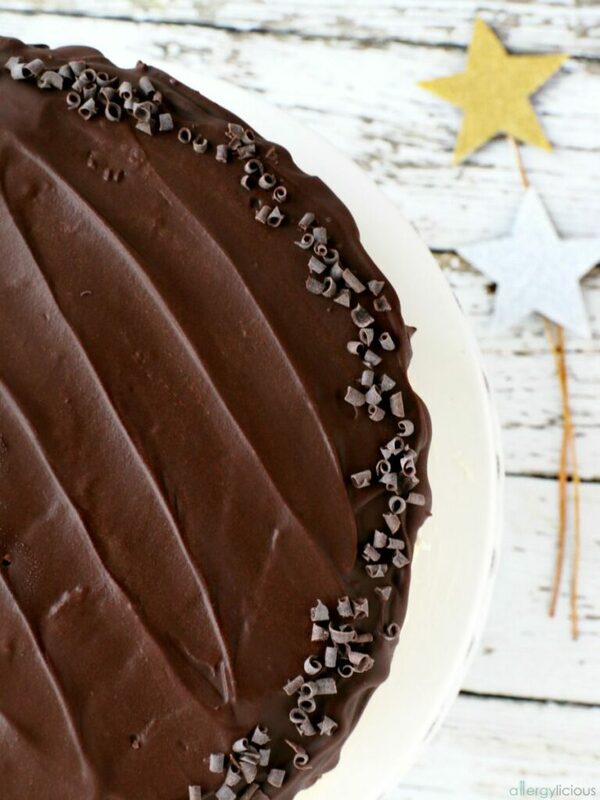 The crumb looks so perfect and that chocolate ganache on top really is the icing on the cake! Wow, this is like the ultimate gluten-free vegan dessert!! I can’t wait to try it. It looks amazing! Even the name sounds luxurious! Red Velvet…and that chocolate ganache icing is something dreams are made from. this really does look perfect! I love red velvet, and this cake looks so perfectly fluffy – I truly cannot wait to try this! Thanks Kristina. Light and fluffy it is….I hope you find an excuse to make it soon. What a beautiful cake! I adore red velvet. 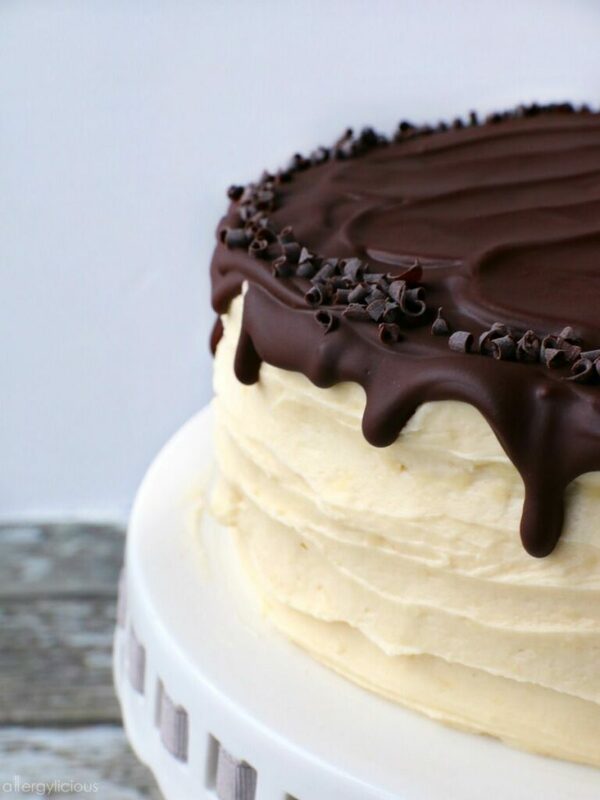 Your addition of Ganache just took it to a whole new level! Thanks Audrey! Any excuse to use ganache and I’m up for it. I love your tradition of starting Christmas out with birthday cake and nothing’s better than red velvet cake! We are totally doing this next year. I can’t wait to see your Christmas cake next year! It is a fun tradition that everyone enjoys (especially when red velvet is involved). OMG. 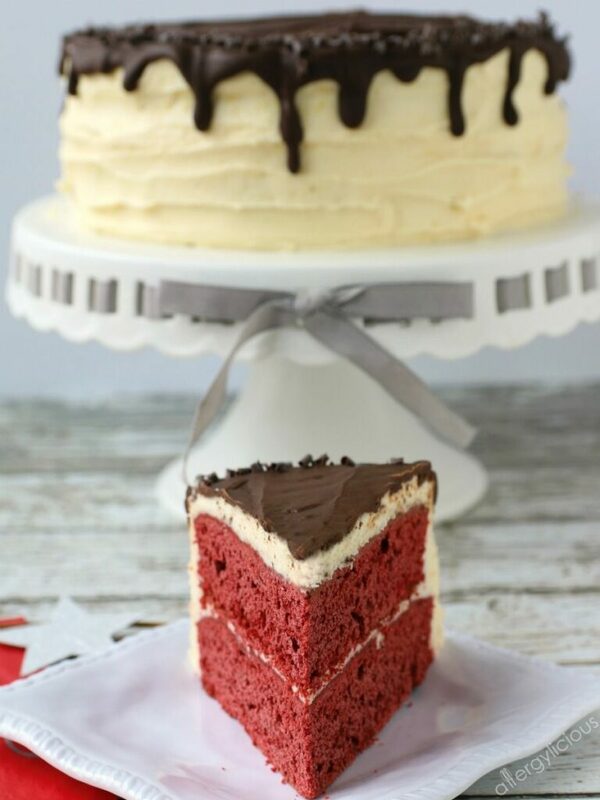 I love red velvet cake! And its so hard to find in Gluten free versions. Excited to try this. I can have eggs how many eggs would the egg replacer equal? Hi Laney, to answer your question, you should be able to substitute the replacer for 3 large eggs. I see the maple syrup listed in the icing ingredients, but no direction for when to add it??? Thanks for catching that Carol. It is now added to the lists of instructions. Thanks for catching that Carol. It is now added to the list of instructions. Hi Nicole,this sounds amazing! I was curious though, would using regular flour make any difference to the recipe? You shouldn’t see a noticeable difference. Actually, I first just used a AP flour when I was first creating this recipe and making it vegan and then switched the flour to GF in another batch and both recipes turned out great. It’s why I try to stick with a 1-1 flour blend so its easy to change if you don’t need the recipe to be GF. Isn’t cream cheese a dairy product, thus making this cake one which doesn’t fit the vegan category? Hi Ina, thanks for that question. Actually, there are several companies out there that now make a vegan cream cheese. Tofutti & Daiya are two of my favorites, but Tofutti was what I used in this recipe. Can i use cake flour instead? Would that change how many cups used? 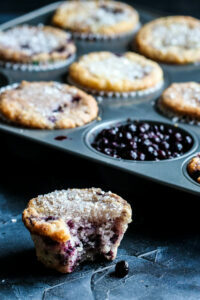 Typically cake flour is lighter and I’d suggest adding 2TB extra cake flour to each cup in the recipe. I haven’t tried it with cake flour, so I’m just going off of previous recipes I’ve made that change to. Come back and let me know how it worked. Thank you for sharing this recipe Nicole. I’m planning to use it for baking cupcakes for my son’s 8th birthday. Do you have any suggestions/recommendations to tweak this into cupcakes other than perhaps cutting the baking time or temp? Appreciate your thoughts. You could cut the recipe in half and also reduce the baking time to 10-15 minutes, depending on your oven. I’m not sure how many you are planning on making with this recipe, but using this recipe will give you 16-18 approximately. I am sorry to hear that it did not turn out for you. I’ve never had an issue at all with this recipe, using Bob’s 1-1. The only thing would be the frosting and that was depending on the type of vegan cream cheese I used. HMMM….And yes, you are correct not to pour warm ganache on top of the icing. I allow it to cool after melted, and made sure to note that on the recipe so others don’t melt their frosting.